This Olexa’s walnut goat cheese salad copycat recipe is the next best thing to the original and one of the yummiest salads you’ll ever eat! 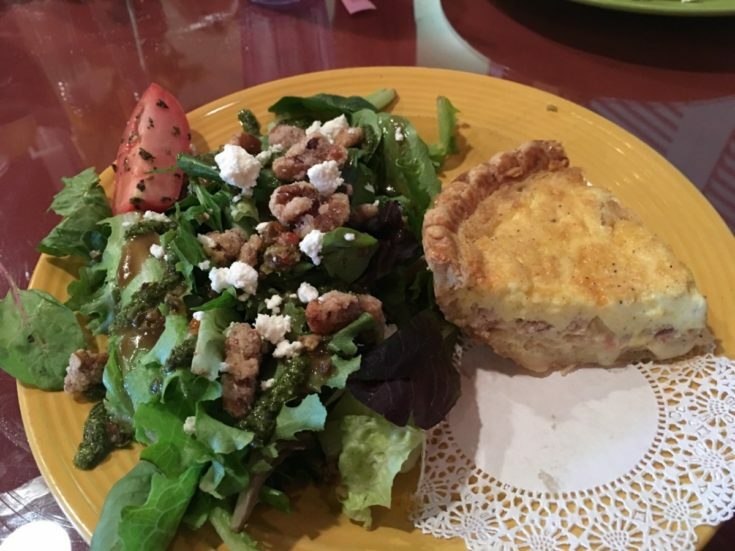 Olexa’s is a charming cafe nestled in the heart of Mountian Brook Village. It is a hot spot for ladies’ celebrations~from birthdays to baby showers to graduations to weddings. The environment is warm & cozy, the food is beyond delicious, and the smell of Olexa’s bakery goods (especially the cakes) is heavenly! This post was written last year, and the photos are a year old as well. But since holidays are around the bend, I wanted to share this recipe again. Since the salad is one of my faves, I decided to try to recreate it and asked our server for some tips. She told us how it was made and which items could be purchased from Olexa’s (the glazed walnuts, the tapenade, the pesto, and the balsamic). I almost bought the ingredients there; however, I opted to try store bought items that would be accessible to everyone~especially Savvy readers who don’t have access to Olexa’s. Copycat recipes are best when common, easily attainable ingredients can be used to duplicate something wonderful. Below is the Olexa’s menu description of the salad, along with a photo of my plate from last week’s lunch. Olexa’s Walnut & Goat Cheese Salad~Creamy goat cheese, olive tapenade, basil pine nut pesto and roma tomato on a bed of spring mix topped with caramelized walnuts and served with house made balsamic vinaigrette dressing. Olexa’s salad is artfully arranged on the plate with large portions of goat cheese and walnuts atop the lettuce. 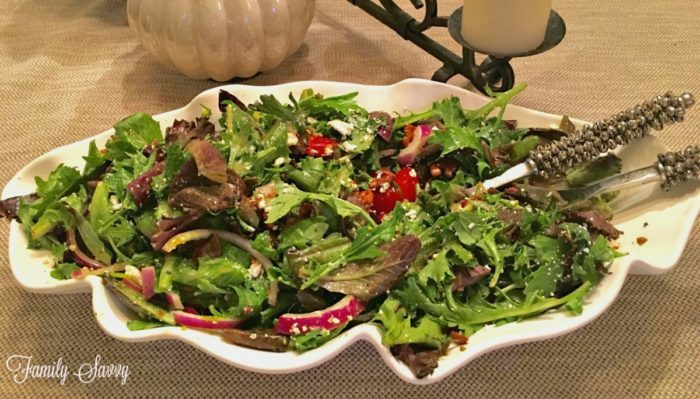 You can see dollops of pesto laced throughout the salad along with olive bits from the tapenade~all drizzled with creamy balsamic vinaigrette. Below, I’ve listed some of the products that I used to make this salad and that I would recommend. Glazed walnuts: I use and recommend my own recipe for glazed nuts here. Basil Pesto: Cook’s Illustrated crowns Buitoni Pesto with Basil the winner in its taste tests for prepared pesto. This one is located in the refrigerator aisle of most grocery stores. I use Kirkland basil pesto from Costco. Olive Tapenade: Trader Joe’s sells a good one in a jar; it is located on the same aisle with pickles and similar condiments. Goat Cheese: Belle Chevre is my favorite and comes in a log that is easy to crumble just before adding to the salad. Balsamic Vinaigrette Dressing: I love Briana’s creamy balsamic for this recipe. The consistency and flavor are perfect. Make Ahead: The glazed nuts can be made ahead and stored in the freezer or an airtight container. The salad is best assembled just before serving, as baby lettuces don’t hold up well if tossed with dressing. So this is the copycat of my fave Olexa’s salad, and I’d love to hear from you if you try it! I love hearing from other savvys, so leave any comments, suggestions, or questions! Nothing pleases me more than hearing from readers:-) As always, thanks so much for stopping by. Be blessed, and stay savvy!!! Arrange layer of lettuces in bowl. Lightly massage lettuces with pesto until well dispersed. Add tapenade and mix throughout lettuce. Add tomato slices, goat cheese crumbles, red onion, and walnuts on top. Drizzle with vinaigrette (be careful not to overdo). 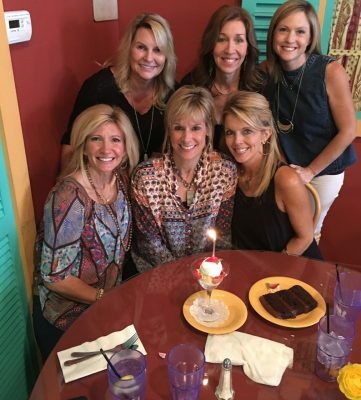 Here is the birthday crew from last week’s lunch. Note the candle topped dessert; it is Olexa’s famous “Cloud Nine.” Barb ordered the vanilla, but it comes in chocolate also. Per Olexa’s menu, it is “lucious vanilla butttercream cake folded with clouds of real whipped cream’ and topped with strawberries.” Served in a champagne glass, it is a feast for the eyes and palate. For more about this wonderful cafe, visit Olexas.com.